French bread comes from the store, right? Did you know that I was approximately 22 years old before it occurred to me that a person could make homemade French bread? I had it in my head that you simply had to schedule a trip to the store to grab a loaf or two of French bread if you wanted to serve it with your spaghetti or lasagna that evening. 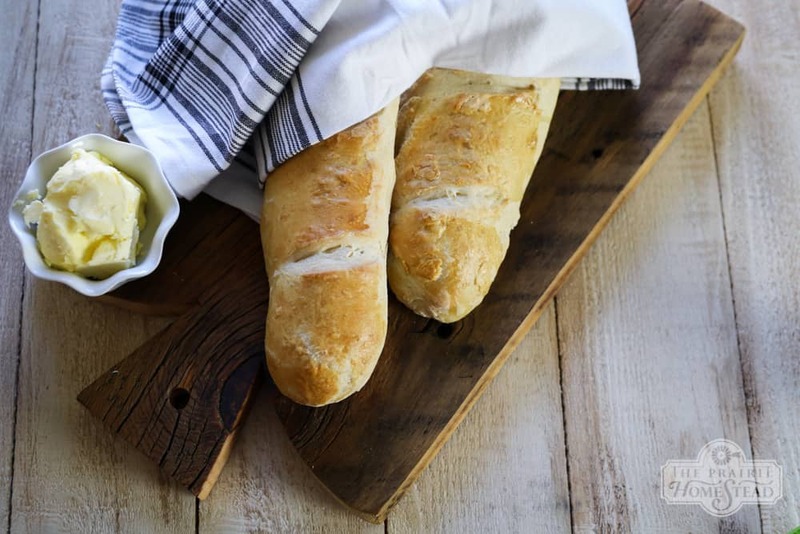 So imagine my surprise, back at the beginning of my real food journey, when I came across a perfectly chewy French bread recipe. And it was even BETTER than the store-bought stuff. Oh. My. Word. 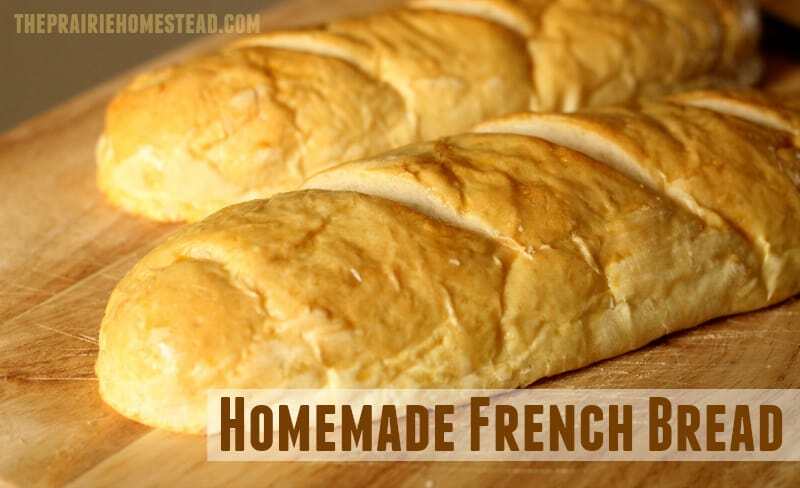 I love making bread of all kinds, but this French bread recipe is one of my absolute favorites. 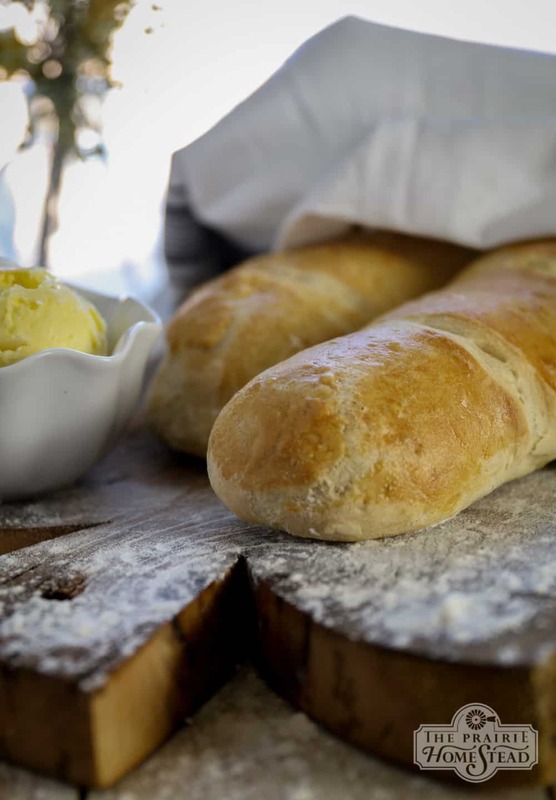 With only five ingredients, you’ll pretty much look like a rockstar when you serve a loaf of this gorgeous French bread alongside a bowl of homemade tomato soup or spaghetti. Place the yeast and sucanat in a large bowl and stir in the warm water until everything is dissolved. Add in the salt, then stir in as much flour as you can. You might not need the full amount, or you may need more– it just depends. You are looking to create a soft, pliable dough that isn’t too sticky. Knead on a lightly floured surface for 6 to 8 minutes, or until the dough is smooth and elastic. Place the dough back in the bowl and cover with a kitchen towel. Allow it to rise for about an hour, or until doubled in size. Roll up the rectangle starting with a long side. 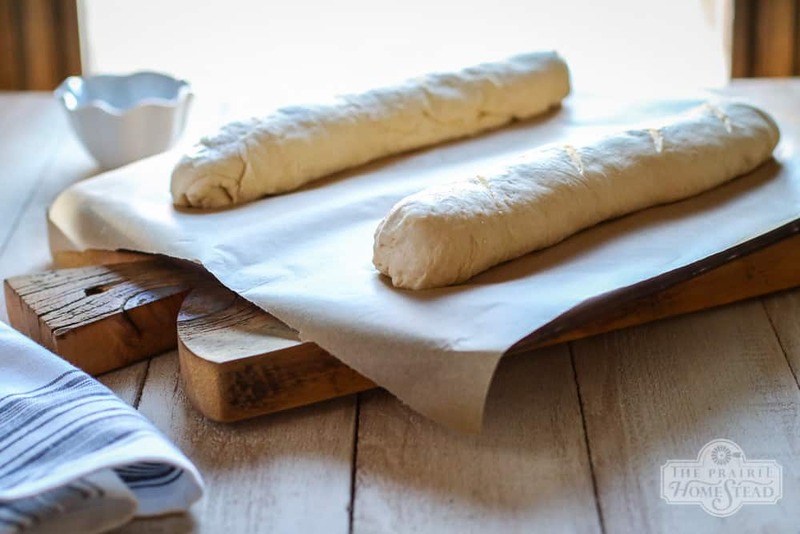 Pinch the ends of the loaf to seal and shape in a “log.” If your seam doesn’t want to stick down, you might need to dip your finger in a bit of water and moisten the dough to encourage it to adhere. Otherwise, it’ll try to unroll during the baking process. Grease a pizza stone (where to buy) or stoneware baking sheet and place the loaves on it to rise for another 30 minutes. Right before you pop the loaves into the oven, brush the tops with the egg wash and make 4 diagonal slashes across the top using a sharp, serrated knife. Bake for 20-25 minutes, or until golden brown. Allow to cool on wire racks before serving. Serve warm, with lots of butter. You can really go with whatever type of flour you like here. Feel free to use whole wheat or half wheat, half white. I generally use unbleached white, and sometimes I’ll throw in whatever freshly ground wheat flour I have hanging out in my fridge. For a chewier bread, try adding 1 Tablespoon of vital wheat gluten to the yeast/sucanat mixture at the beginning. I have no experience in trying this recipe with gluten-free flours— so I have no idea if that would be successful or not. I have never tried preparing this recipe using the “soaked grains” method. Feel free to try it out. If you have a large family, you might want to double the recipe. It’s enough for my little family, but the loaves aren’t huge. I supposed you don’t *have* to use stoneware to bake this bread, but I sure recommend it. I think my pizza stones are some of my most-loved kitchen tools. Couldn’t live without ’em. I was also going to add that if you have some left the next day, it makes a great garlic bread. Just slather some butter on top and sprinkle on garlic powder and parmesan cheese before sticking it into the broiler. 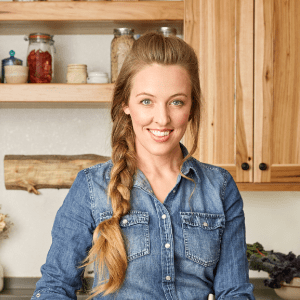 Oh yeah… Love the butter idea! Are yall sure about the temp of the water….in my experience the water had to be about 100 to 105 to activiate.???? I hope we have this right. Hi Jill. Have read your site, and am very excited about the future info. My wife and I (both Christians) chose to go this path mearly by chance a number of years ago. So to find something else out there for the all natural thing (not always being dependent upon Mother Earth News) is great. We really like the Eggshell story on your site. We have but two laying hens, but they keep us well indowd in eggs/shells. Sense I had to retire (Line of Duty injury Fire/Medic) I’ve really got busy with the house, and trying differant ways to save on our budget. Poor Karen must work yet, but it won’t be too much longer. I do the same thing with my french bread too! 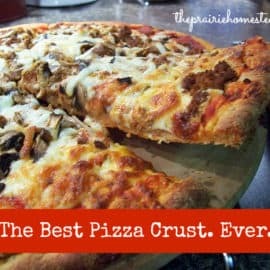 🙂 I love the soft crust it gives! Sometimes, to change things up a bit, I will sprinkle some shredded cheese & herbs (and maybe a little garlic) on the rectangle before I roll it up. It goes SO well with stew & it looks pretty when you slice it! Can an organic sugar substitute like Agave Nectar be used instead? Sucanat is unrefined whole sugar (and they do sell organic), and it is much better for you than sugar that is refined. 2 teaspoons throughout the whole bread is not a lot anyway. But most agave on the market is made through a highly chemical process from the starch (similar to corn) and actually has even more fructose than corn, so I’d not recommend using it. Found this recipe yesterday cause my mom couldn’t get me her recipe for French bread on time. Was amazing. My husband loved it! Will be making this recipe often. Thank you!!! I use a similar recipe but I leave off the sugar, making it only 4 ingredients. It takes a little longer to rise, but it’s so worth it!! YUM! I love fresh baked bread and this one looks like an easy treat I could pull together in a pinch 🙂 Thanks for sharing!! Any changes to temp/time if using a regular cookie sheet? I don’t have any sort of stoneware to bake on. Thanks for sharing this recipe! I’d definitely start out by reducing the heat if you are going to use a regular sheet. I used a dark non stick cookie sheet at the same time/temp and it worked out beautifully. I can’t wait to try this with some Einkorn wheat flour!!!! Wow, that seemed easy enough .. definitely have to give it a try now. 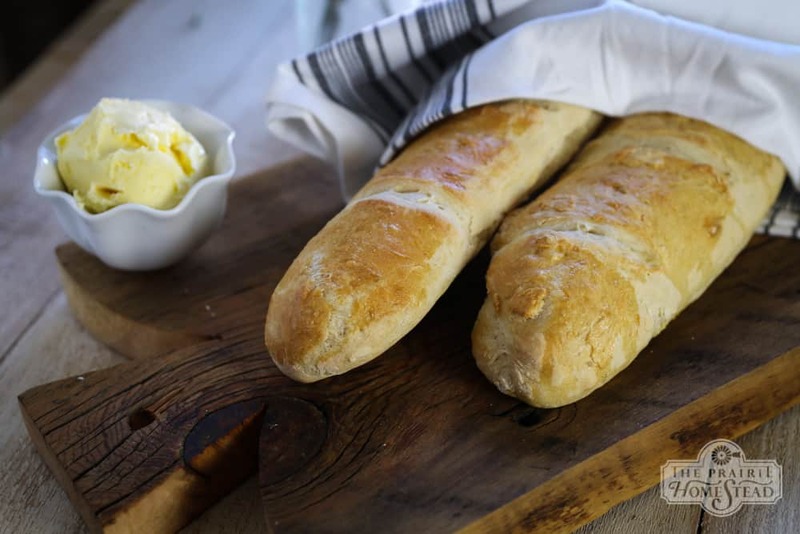 This recipe seems much more simpler than others I’ve tried in the past….which is why I haven’t made french bread in over a year. I’ll be trying your recipe this weekend. Thanks! Would a cast iron griddle work as well as a pizza stone? Hmmmm… It might– I’ve never tried it– but I can’t see why it would hurt! Was looking at your pizza stone right now on Amazon . . . . .Does it really work well? Have you used it awhile with good results ? The reviews on there are not so hot. . . . . Try Pampered Chef. My mom has a lot of stone bakeware from them and they are great! They are a little pricey – which is why I don’t have any – but they work awesome! Just buy a Pampered Chef one, there are things you get what you pay for and seriously, they really aren’t that much when you break down how often you use it and what a great product it is. I’d rather pay a few dollars more for quality, than not much for junk! I have a couple of the Pampered Chef pizza stones and they really work well, especially after they are seasoned. The more you use them the better they become. Like cast iron pans. Thank you so much for this! I’ve been trying out bread recipes like crazy but this one looks extremely successful through it’s simplicity! Thanks again. Saw your Facebook post & couldn’t comment there. Just wanted to say that I think you’re awesome and I have so much respect for you to stand up for what you believe in. I hope that everyone’s comments are sliding off your back and you realize how great you are. Thanks for staying true to yourself. Me too. 🙂 Wisdom from my daughter’s Veggie Tales DVD: You never have to be afraid to do what’s right. As someone who’s a ‘convert’, it DOES make a difference when people aren’t afraid to tell others about stuff like that. You”re a blessing. Yup. Felt like a rockstar last night cuz of this recipe. Had to do it on a cookie sheet and it was still fine. I put a shallow pan of water in the bottom of my oven as I typically would when I bake bread and preheated to 50 degrees higher and turned the oven down to correct temp just the moment before I slid it in. I’ve read this helps the temp not drop too low at the start of baking, allowing for maximum rise before the loaves start to harden. I love love love your blog and appreciate the info you share! Blessings to you! Wahoo! I’ve tried the pan-of-water trick, but never the deal about preheating the oven hotter– it totally makes sense though! Definitely gonna implement that next time I make this recipe. Thanks for the tip! Great idea! The steam from the water is good for the bread too. Great alternative to rolls with our Saturday soup. I did three sticks from each batch to fit on the tray better and sprinkled with sesame seeds. I also added a small amount of olive oil (1tablespoon) and had a mix of white flour and spelt for the second batch.Will see how it goes. Awesome! Love the sesame seed idea– hope you enjoy it! I have a similar recipe. The only real difference is that I use honey instead of sugar or other sweeteners. I try to get local, raw honey in wherever I can. Yes, I think honey would be great in it too! However, even before popping the bread in the over, something must have been already wrong with my measurements as although I converted your cups of water and sugar into metric measurements, my dough ended up being extremely sticky even after I added DOUBLE the amount of flour you recommended. So my dough ended up kind of flattening out on the rack before I put it into my scorching hot oven. Learning from my mistakes, I would really like to give this another go so I wondered if you could advise what an actual cup means in your world and if your teaspoon is the “smaller” spoon – ya know, teaspoon vs. tablespoon kinda thing….? Thanks in advance! Oh dear– that doesn’t sound so good! My cup measures are 8 oz– although I usually just add flour until it looks and feels right. And yes, my teaspoon is the small one. 🙂 Hope your next attempt is better! A cup is 8 oz or 250 ml, a teaspoon is 5 ml, a tablespoon is 15 ml. There are conversion tables and calculators available all over the internet. Brian, instead of automatic mansplaining, perhaps you could have read my comment properly: I *did* convert the measurements. Plus, Jill and Penny kindly already answered my question, so there was really no need for your comment. Can you divide it into two loaves and freeze one? My dough is rising right now and I’m excited to try! A friend of mine used to make slings for bakers to let their french bread dough to rise in. It was basically a cotton duck long sling. They would let their dough rise in it to get the french bread shape. Wondering if anyone has tried using regular table salt instead of sea salt as i don’t have any on hand. I have rapid rise yeast. how much do I use? Amazing recipe! Just now I have thrown it in the oven and I can’t wait to use it to top my French Onion Soup tonight! To God be the glory forever!!!! Oh YUM Leslie- that sounds delish! Yum! Just made these! They’re delightful. I have to say though – do NOT oil your pizza stone! You may ruin it 🙁 I just greased some tin foil to put the bread on for the second rise and then put the foil/baguettes on a preheated pizza stone. Worked like a charm! Ooh… good to know- I’ve oiled mine in the past without trouble, but I supposed I’ll stop! glad you enjoyed the bread! Im making this right now. Can’t wait for it to be finished!!! You should try baking bread from natural wild yeast starter (my starter is over 200 years old passed through generations from Sicily, so neat!). Without getting into all the amazing science the basic gist is that it breaks down the wheat (through fermentation) which actually allows it to be digested properly by our bodies…in addition to actually being good for us. 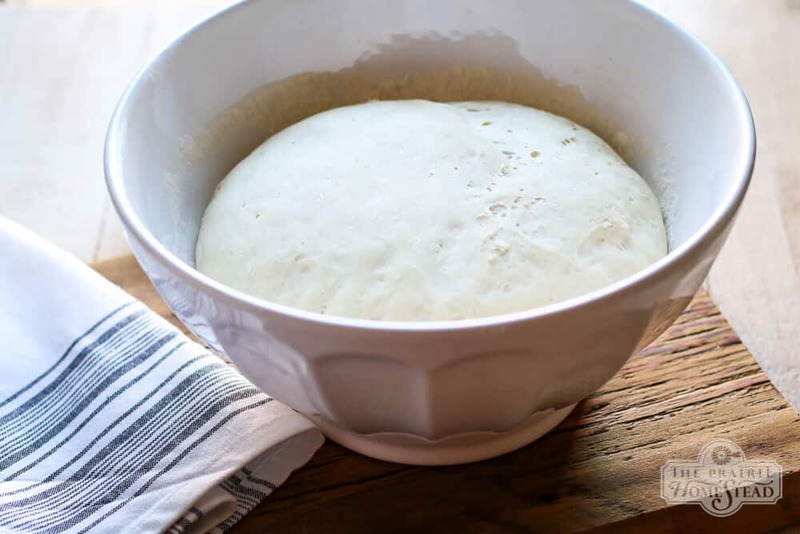 The only way to achieve a healthy bread is by using a starter and allowing your bread to ferment and rise for at least ten hours. Modern bread, using man-made dried, rapid rise yeast (whether you are buying it or making it) is a long term death sentence. Rapid rise yeast was created merely to pump out more loaves of bread at a faster pace to make more money and deterioration of health became the side-effect. 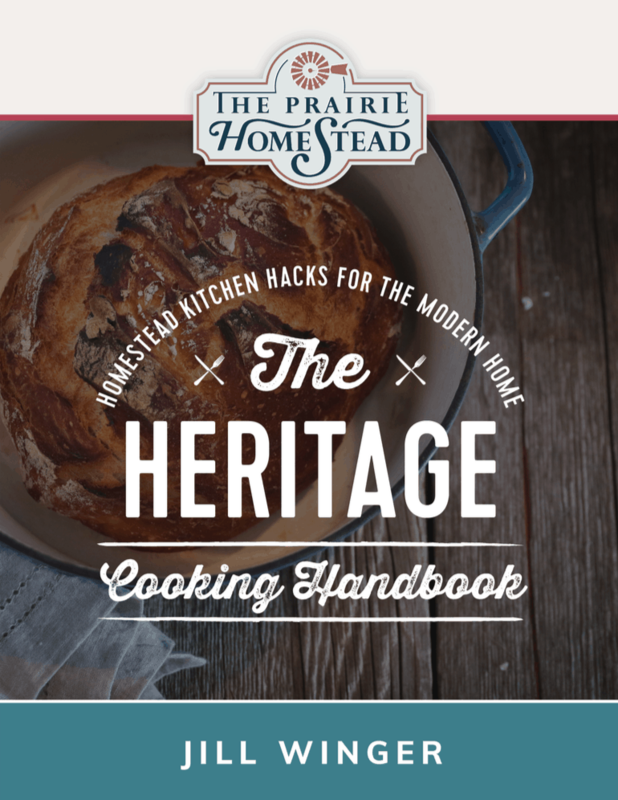 Great book on wild yeast is called The Art of Baking with Natural Yeast. 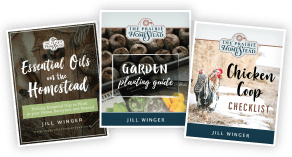 I’ve browsed through your blog and it definitely seems you’re about natural, sustainable etc, so maybe you would be interested in reading up on it! That would pretty much be the same as sourdough, right? I’ve done sourdough in the past (and love it! ), but I need to get a starter going again! I was just wondering how i would go about making it a garlic bread to be pared with spaghetti right away? is there any certain way that comes out better? My garlic bread is pretty basic– I butter slices of bread, and then sprinkle a tiny bit of garlic powder, and then some Parmesan cheese on top. Stick it under the broiler for a few minutes until it’s golden brown. Yum! You mentioned that the type of flour , white or wheat, doesn’t make a difference. I was wondering, however, if you’re referring to All Purpose or Bread flour? That usually does make a difference. I was assuming you meant Bread flour, but I didn’t want to try the recipe without being 100% certain..
Hi Joy- I’ve actually used both all-purpose, as well as bread flour for this recipe, and it works either way. Just made this. Everyone loved it. I didn’t split the dough, just made one big loaf and it turned out fine. Next time I will double the recipe and do two loaves so that I can have one for snacking on the next day. Yes- doubling this recipe is Highly recommended! 🙂 We actually had it for supper tonight as well! HEY!! I am so happy I found this ! I am working on my second go at the bread. I added garlic and cheese last time…big hit! Tonight its garlic, basil, and onion bread to go with alfredo pasta and salad! The recipe you have here is pretty close to the one I use but you should try something I do that I actually stumbled on by mistake…on the beginning when you are dissolving the yeast in the correct temperate water…instead of sugar or anything else the using maple syrup!.. I don’t know why it works but itALWAYS seems to proof perfect and finished product is so soft and fluffy. Also when dissolving the yeast just dissolve the yeast,syrup, water, and maybe 1/2-3/4 cup flour then whisk it. Let that sit for10 minutes and you will see it grow and fluff out and you will know its gonna be HAPPY dough.. I mean is there anything better than HAPPY dough?? After it has sat for10 minutesthen add remaining ingredients and proceed as directed. Hope this works for someone ..
Nope- ain’t nothin’ better than happy dough! Love the syrup idea! to the person who suggested this method…I use organic honey like the maple syrup in your yeast mixture. But i am going to try your recipe for “happy” dough. i like the idea of mixing a small amount of flour with the yeast,water&whatever you use for a sweetner. For everyone on the site…. I just really started baking bread in the last 6 months. I had made it in the past but very few times, and sometime used a machine but now i am trying to learn home baking bread. I am better with wheat bread but am still trying also to master the french bread crusty type loafs. Hopefully I will get the hang of it soon…my husbands grandmother was a master baker that worked for the Queen so thats a lot of expectation for me!!! thank you so much. I’ll try your way. Mmmm. I just made this bread (at three am!) due to an intense bread craving. Perfect! I paired it with a reduced balsamic vinegar paired with brown sugar and some spices to give the balsamic a faux aged taste and syrup consistency. Perfect pair! We ate half the first loaf just out of the oven, so hot it was burning our mouths. Tasty. YUM- the balsalmic vinegar reduction sounds to-die for! Please give us the ingredients for the balsamic/brown sugar/spices mixture – please. yummy….. best recipe yet. going to make it into smaller rolls for beef dip next time. Oh yum! Love the beef dip idea! I just have to say how much I love the “print” button on your recipes. This make it so much easier for me to use your wonderful recipes. 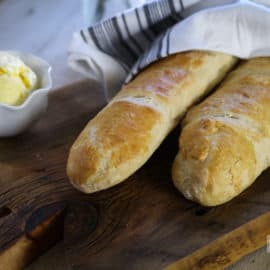 I’ve been searching high and low for an easy and delicious French bread recipe the last couple of days. I have now printed this one and it will definitely become a recipe I depend on. THANKS! Whoo-hoo! Yes, my assistant just finished updating all the recipes, due to popular demand. Glad you are putting it to good use!! Just baked this – we have 2 gorgeous loaves with a crunchy crust and soft, chewy interior – perfect for our carrot ginger soup. Enjoy! And carrot ginger soup = YUM! 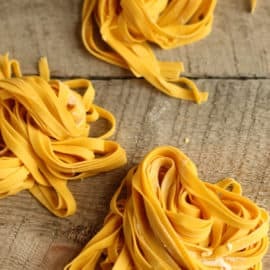 Off to the kitchen to make this immediately, I already have the spaghetti sauce brewing, so it will fit in with my supper great tonight. Thanks for the simple recipe! I notice you have the loaves rising on the pizza stone, so the stone doesn’t get preheated. I followed the directions the first time, and my bread was undercooked on the bottom and very dark on top. Probably because it takes the pizza stone so long to heat up. I’m making 8 loaves using this recipe for Thanksgiving today, and I plan on preheating the stone and transferring the loaves to the hot stone just before it goes in the oven. I think reducing the oven temperature would also work fine, though. Anyway, this is a really lovely, delicious bread. Thanks! I’ve made this bread at least three times in the past few weeks since finding this recipe and every time I make it I feel like a total rock star! I just made a double batch yesterday, made the loaves into rolls and froze a dozen so I have fresh, homemade bread within reach at all times! 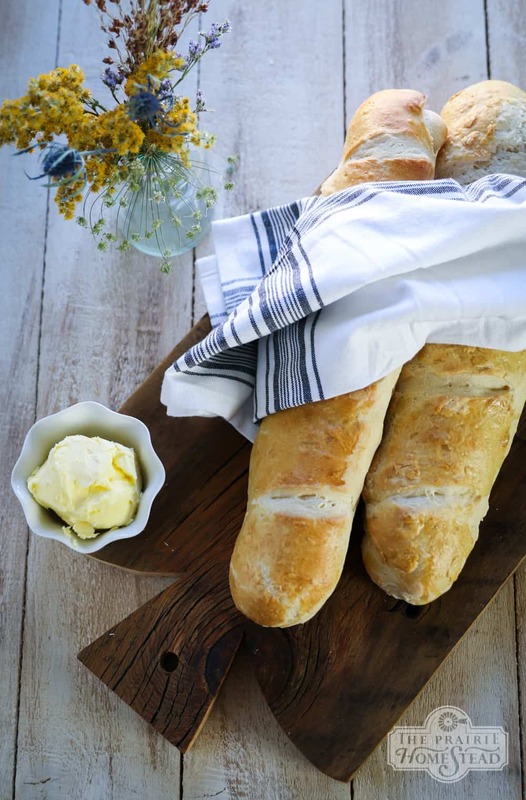 Thanks for making homemade bread look so easy! Yay Allie! You are a rockstar. 🙂 So happy you are enjoying the recipe! I have never in my life baked a successful loaf of bread before trying this recipe but I did try it and guess what?! It came out awesome! 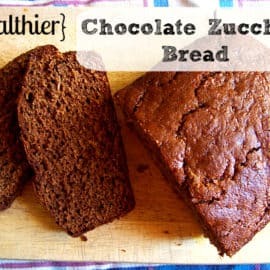 Just made this today and how easy it was… And the bread was amazing in taste… My family loved it. If you want your French bread crusty you put a dish of water in the oven during the preheating. That gives it that characteristic crunch. Angela, cold or boiling water? do you leave the dish of water throughout baking? thanks for the tip. You put in cold but it starts to boil and evaporate during the baking and yes leave it in there until the oven cools off. Mine ended up looking more like baguettes than French bread because I must have rolled it out thinner than required. Still delicious! Thank you. Do you think spelt flour would work?? Thanks! my bread turned out terrible. it did not rise at all. i used yeast that was fresh, i used plain flower. what did i do wrong??? Was your water possibly too HOT rather than warm when you attempted to dissolve your yeast? That will definitely kill the yeast … no rising, no matter how fresh it was. You used flower instead of flour. Made this tonight without a second thought. Bread was perfect. Eating it right now. Sooooooooo darn good. Great recipe! So i tried this again and found what i did wrong. my water was twice as hot as it should have been. i never checked the temperature until today. my french bread turned out AWESOME!!!! family loved it. thank you so very much for this simple but great bread. Does anyone know if this can be done in a bread machine on the dough cycle? Made this tonight it was fantastic!!!!! I need to try this! I’ve always been very comfortable in the kitchen except my Achilles heel is yeast breads. Maybe I haven’t been trying the right recipes, and maybe I’ve given up too quickly! 3. Let rise on a parchment paper and put on the stone removing 1/2 way througj the cook. Hi Jill – Just a quick Thank You!!! I have had the worst time making bread since we moved to Utah – the altitude adjustments were killing this southern girl from back east. Anyway, I made it today and my Italian husband literally stood at the stove with a stick of butter and ate 3/4 of a loaf before it was even cool enough for a sane person to touch. Tomorrow I am using your biscuit recipe to make a southern version of meat pies for a church luncheon…wish me luck. I made this bread, but only got as far as allowing it to rise before I realized my yeast must not have activated because it didn’t rise at all. Could it be that the water needs to be between 100-115 degrees? Thank you so much for this amazing recipe. It is so straightforward to make and the bread is so delicious – lovely and light inside with a super crust on top. I have tried other French bread recipes but have never had this success before. I will definitely be making it again. Yay! Thanks what I like to hear! Okay, we are just now cutting out ALL processed foods from our diet. We’ve always eaten fairly well, but decided to go ahead and make the jump to get all of those chemical preservatives and natural flavorings. Anyway, I was under the impression that white flour, even unbleached, was considered a refined type of food and not whole foods since they remove the most nutritious part of the wheat during that processing. Can you weigh in on this for me? Everything is very confusing and I am trying hard to figure it out! Especially since you seem to agree that refined sugar is not a whole food…what makes the white, refined flour okay? Does it go through less of a process than the sugar? This is a great recipe and super easy. I bake all my own bread, so I know from good bread recipes! I made half the recipe because I just needed enough for one meal for two adults and two toddlers. I hate kneading, so I do it in the food processor. I also buy bulk yeast that I know is good and I keep it in the freezer so I never bother to proof. I put all of the dry ingredients into the food processor and let it mix for about 10-15 seconds. Then I slowly pour in the warm water while it’s running. When the dough looks “right” to me (usually when it starts to pull away from the sides and form a ball) I stop the water and let it run for about 2 minutes. I check the dough by touching it. If it needs more Kneading I run the processor for another minute or so. Everything after that is as normal. Just a little shortcut for ya! I love this bread!!! 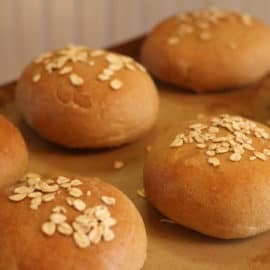 I have NEVER made homemade bread and this was simple and easy and fun!!! I’m so glad I found this recipe. Last night I made it for the third time and decided to cut it into three instead of two. I rolled out and rolled up each piece, then BRAIDED them together. Just before sticking the braid in the oven, I did the egg-wash and sprinkled on just a tiny bit of coarse ground sea salt from my grinder. It was amazing!!! The perfect complement to our brisket & veggies!!! Mmmmm!!! I am loving this recipe. I have brought it to a few potlucks and it is a hit. 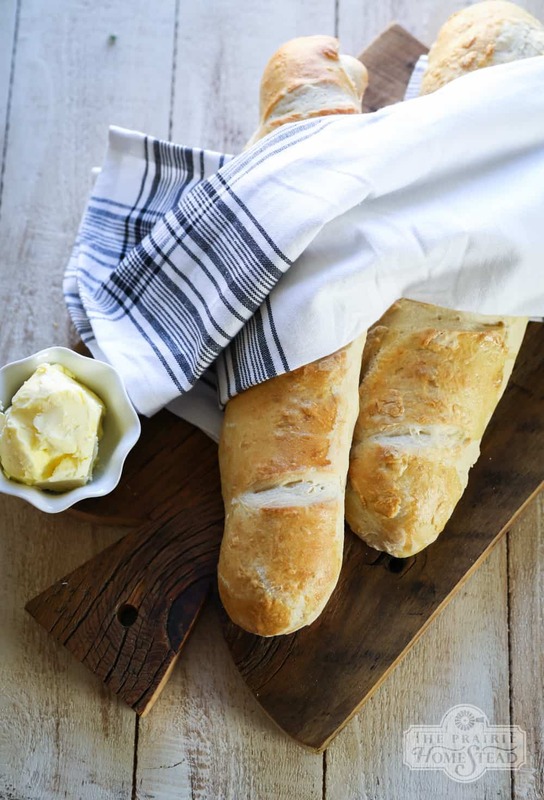 Who doesn’t love homemade bread. Sometimes I roll up one loaf with herbs, maybe some fresh garlic and I think cheese would be great too. I have used both maple syrup and honey with the yeast and both produced good results. I might try it with whole wheat flour since I have a lot on hand right now. Thanks so much for this. It is a keeper. Hi Jill, thanks for the recipe. I tried it an everything looks good. Unfortunately the bread is a little chewy and kind of heavy. I used all purpose flour, do you think that could be the issue? How long did you let it rise? Sometimes a shortened rise time or inactive yeast will make it heavy. I bought new yeast and let it rise for 60 minutes the first them. On the 2nd rise, I let it sit for about 20 minutes. I did add in a lot of flour while kneading which might have caused an issue. The flour was also a little old and stored in the fridge. Yes– if you added too much flour, it definitely could have made it too heavy. I like the dough to be smooth and pliable when I’m done kneading, but still moist so it doesn’t get crumbly. Jill, I have made this 8 times this week (it’s Wednesday)! We have ten people in our house and they keep on asking for it!!! I don’t know if someone has posted this yet but I made several loafs and froze them! Its great for those days when I want bread but don’t have the time to make it. Just wrap in plastic wrap that has been sprayed with cooking oil and put the balls of dough in a freezer bag. You will get a good 6 months or better that way. My bread collapses if I try to score it. How do you make the cuts without the bread sinking? It might be because it’s risen extra-high before scoring. Mine will deflate a tiny bit after scoring, but then puffs back up in oven. I made this for the first time tonight and we loved it! I was making a pasta dish so decided to add coarsely chopped fresh garlic and Parmesan to one of the baguettes before rolling. Delicious! This recipe will be a household staple for soups, stews and pasta dishes. The leftover slices will be great toasted for sandwiches as well. Love the garlic and parm addition idea– so glad you enjoyed the recipe! Jill, what is the difference between French bread, Italian bread, and a baguette? I am confused. I do know what a baguette is as we purchase them on a regular basis. Your French bread looks, to me, like the Italian bread I have seen for sale in the grocery store. I like chewy breads except for some sandwiches. Thanks. I am using a cookie sheet because I don’t own a stoneware sheet. If I reduce the temperature of my over to 350 degrees, then around how many minutes would the bread take to bake. Made this yesterday and the family and I loved it!! Seriously, it only lasted through dinner. And it was made right after the older kids got home from school. 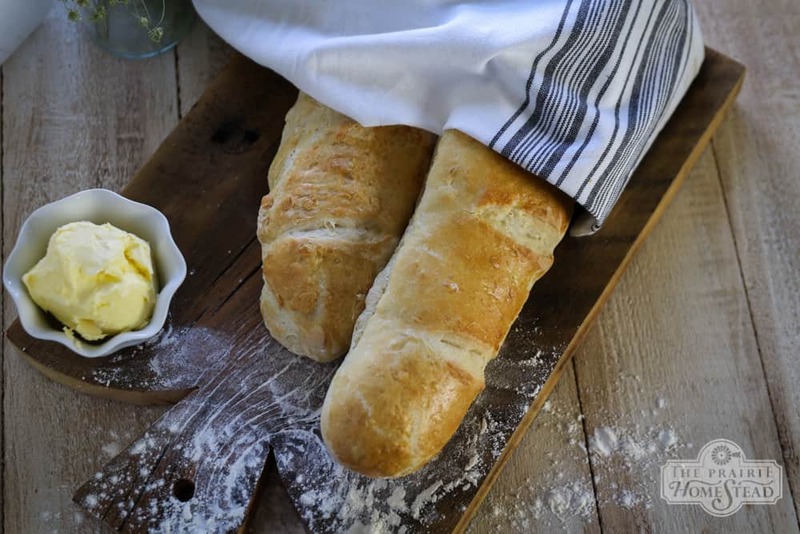 I’ve only made bread a handful of times and this was by far the simplest and best recipe!! Thanks so much! Yes, definitely use stoneware for baking your breads. I can recommend and help y’all with the right Pampered Chef stone. 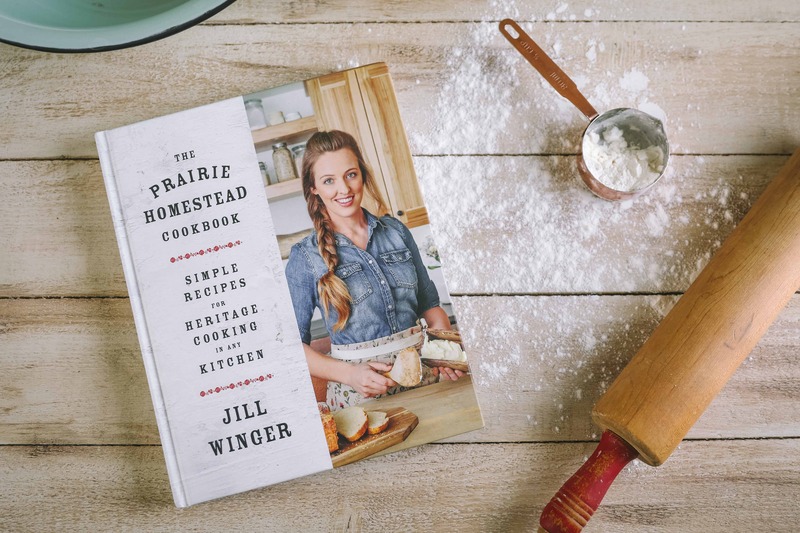 Jill, in the photo it looks like the loaves are rising on parchment. Do you take them off the paper and put them on a bare stone to bake, or bake right on the paper?